Viking Squares was founded in 1984 by Jack Broadhurst who lives on Marston Lane. He continues to call on a regular basis for the club. and decided he would like to try his hand. After taking lessons from experienced callers Jack decided to form a club in the village. 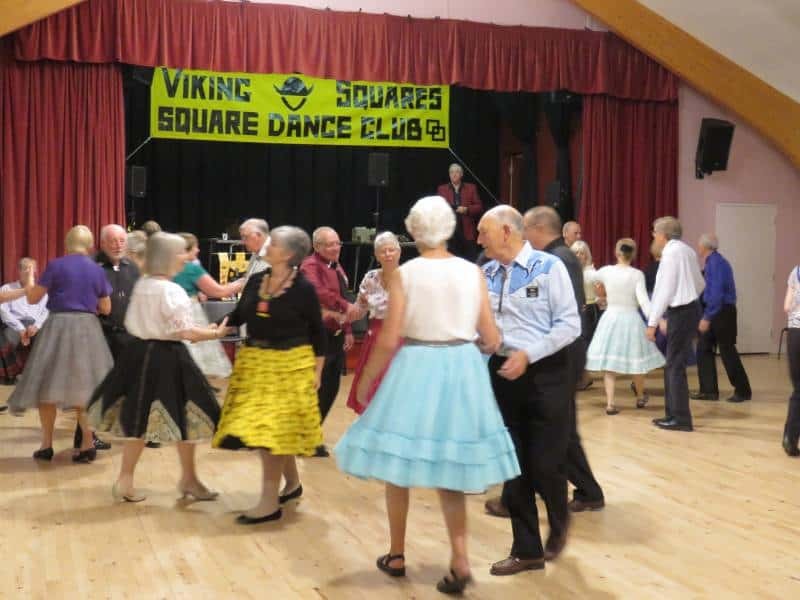 Over the many years Viking Squares has been in existence numerous people from surrounding areas have learned to dance and are continuing to do so. At the present time the club has in the region of some 40 plus members coming from as far afield as Lincoln, Newark and Nottingham who come regularly to dance in Allington Village hall. 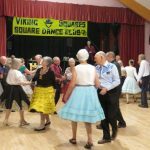 Members of Viking Squares also enjoy visiting neighbouring clubs; attend square dancing holidays and weekend breaks further afield. Club members also enjoy walks which often end with a pub meal. We like taking part in quizzes and we hold a B.B.Q. during the summer. All manner of occasions are celebrated with a ‘pot luck’ supper. Square Dancing is guaranteed fun and friendship set to music. It is essentially a team effort. Eight people form a square and dance a pattern of figures sung by a caller. As well as being sociable, square dancing provides good mental stimulation and gentle exercise for people of all ages and walks of life, even those with two left feet. No previous experience necessary. No fancy dance steps to learn. As with most activities, lessons are necessary to learn the basics, the fun begins the minute you step onto the floor. Once you know the moves you can, if you wish to dance at over 200 clubs in the U.K. and 9000 clubs world wide. You can also take part in holidays and other events connected with square dancing. If you want to get in touch with Viking Squares by email just use the form below and we’ll get back to you as soon as possible. Alternatively, you can ring Judy Grummitt on 01400 281497. Why not come along and give it a go – you’ll be glad you did. Tuesday evenings Allington Village Hall – 7.30 – 10. 00 p.m. With a break for a tea or coffee and chat. Beginners are most welcome at any time -there is always someone available to lend a hand and help you get started.